President Muhammadu Buhari (All Progressives Congress), Oby Ezekwesili (Allied Congress Party of Nigeria), Atiku Abubakar (Peoples Democratic Party), Obadiah Mailafia (African Democratic Congress), Kingsley Moughalu (Young Progressive Party). It was a debate many attendees found interesting despite the absence of the two main contenders. However, those interviewed by PREMIUM TIMES could hardly distinguish the performance of the three candidates who eventually participated. The debate was as apolitical as it was passion driven. The candidates rather than take shots on each other tailored their points on questions thrown at them by moderator Mark Eddo, interviews conducted by PREMIUM TIMES after the presidential debate Saturday night showed. 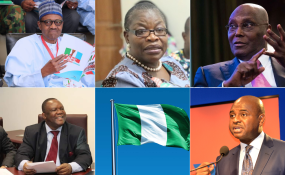 Fela Durotoye, Atiku Abubakar, Oby Ezekwesili, Muhammadu Buhari and Kingsley Moghalu were the five aspirants invited to take part in the debate organised by the Nigerian Election Debate Group (NEDG) and the Broadcasting Organisation of Nigeria (BON). But President Buhari of the ruling APC and his main opposition challenger of the PDP, Mr Abubakar did not attend. In their absence however, the presidential candidates of the Allied Congress Party of Nigeria (ACPN) Mrs Ezekwesili; The Alliance for New Nigerian Party (ANNP), Mr Durotoye; and the Young Progressives Party (YPP) Mr Moghalu, took to the stage to sell themselves to Nigerians. Respondents rated their performance high but were quite reluctant to identify who did a better job among the candidates. Moderator anchored questions thrown to the candidates mainly on the fight against poverty and corruption, security, education, health and how they will fund their respective governments. Perhaps, statistical blunders recorded during the vice presidential debate five weeks ago informed the decision of the candidates to appear quite cautious in reeling out facts and figures this time around. They rather focused on their plans, programmes and how these will be funded. In the end, they succeeded in blowing away the minds of the spectators. Most of the observers of the debate who described themselves as non-partisan rated the three candidates high and said it was a close call. Others gave it to the candidates they apparently supported. A spectator who simply identified himself as Collins said it was almost impossible to grade the candidates. "I believe three of them stood out at each category depending on the field they answered. When you look at it critically, you will see they did not debate. From their responses, you will see each of them has his own line of argument in a particular question since there was no common denominator of the answer. "So ultimately you cannot grade them. This shows Nigerians are getting it better by this type of debate. It must be encouraged because left to those who are in this hall, I am telling you our president would have emerged from these three," he said. "For me, the candidates performed very well in terms of their apt response to the questions and comportment,"Peter Morgan, an Abuja-based lawyer said. "My challenge is that whether good people like these will be allowed by the system to lead the country. "The candidates did well so it's hard to say which one is better but I think any of these three are far better than the main contenders. Generally, the debate went well but I would have been happier if all the podiums where filled." Waziu Hawaya, a supporter of ANN first gave pass marks to all the debaters then thumbs up to his candidate. "I am very amazed by their performance, three of them are a bunch of good brains. They reeled out their plans and also gave out plans on how they will execute them. I can say I am impressed and that I came to Nigeria for this. Fela Durotoye is someone I love and support. so it will only natural for me to say he was the most outstanding." Zahiri Yusuf described their performance as 'apolitical'. "It was not a very politically inclined debate. It was something borne out of passion for a new Nigeria. It's not exactly about who did better or who I support but general you can see hope. When you analyse today's event, you see good intents." Mr Yusuf went on to rate the candidates based on character rather than performance. "Quiet frankly I will put two people up - Mr Durotoye and Mr Moghalu - on a similar scale. Ezekwesili was good but one way or the other she is still from the old brigade but these two new guys are very excellent and gave practical analysis on how they will solve the problem of Nigeria." Henry Ewononu, a medical doctor, however, gave it to Mrs Ezekwesili. "She was quite outstanding perhaps because she has an advantage of being in the government in the past so she was able to combine cognitive knowledge with practical experience. "Others also performed excellently well, all of them has a good grasp of what the issues are," he enthused.